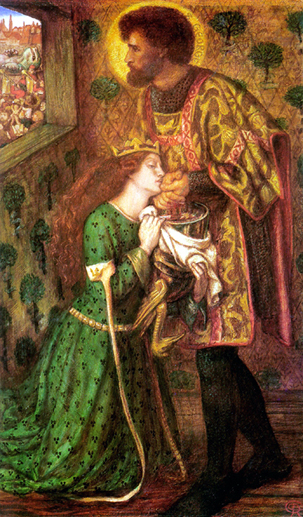 St. George and the Princess Sabra was painted by Dante Gabriel Rossetti in 1862. This was the last work that his wife, Lizzie Siddal, posed for before her death. I find myself searching her face, as if it were a photograph, looking for signs of what was to occur days later: her overdose of laudanum. One day she was a simple milliner’s assistant. Then suddenly she is discovered and begins modeling for artists in the Pre-Raphaelite circle, captured forever on canvas. 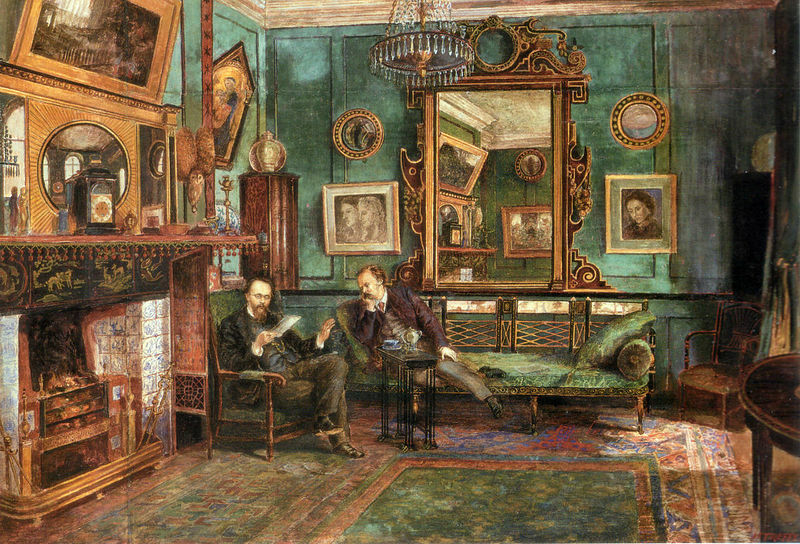 With a talent for painting and poetry herself, she falls under Rossetti’s tutelage and even procures the great John Ruskin as a patron. But Lizzie was often ill and became addicted to Laudanum. 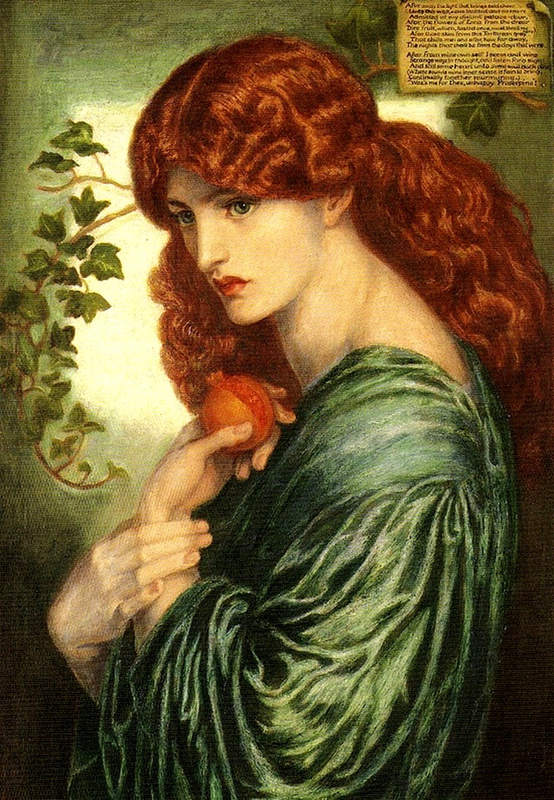 She married Rossetti in 1860 and shortly after they suffered the tragedy of a stillborn child. Their daughter had died in Lizzie’s womb weeks before she was delivered. 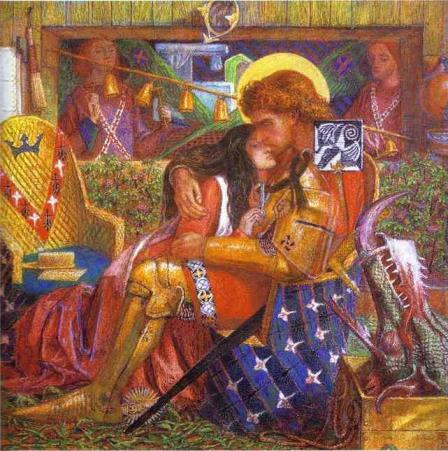 Here we can see the triumphant St. George embracing Princess Sabra, both of them seemingly oblivious to the dead dragon. The story of St. George was a legend handed down from the Crusaders and was printed in 1483 by Caxton in a book called The Golden Legend. St. George happened upon a town with a horrible dragon. The townspeople had been feeding the dragon sheep in order to keep it at bay. 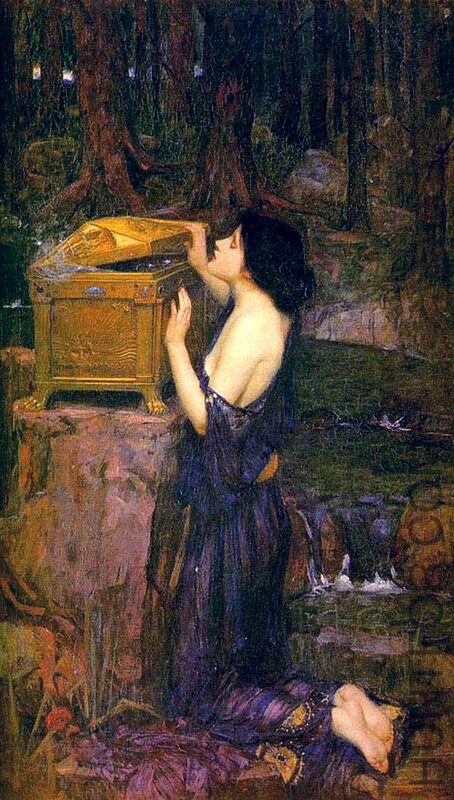 In another version of the myth, they fed the dragon their children who were chosen according to a lottery. They also gave the dragon young virgins. St. George attacks and slays the dragon, saving the city. He is rewarded with Princess Sabra’s hand in marriage. Gorgeous images, Stephanie! I haven’t seen these in such vivid colors before! 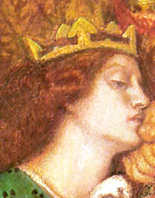 The tongue hanging out of the dragon’s mouth has always struck me as humorous, although I’m sure Rossetti didn’t intend it to be. It just looks so much like my dog when he sleeps on his back. Thank you so much for posting this, Stephanie. I don’t think I’m very familiar with this piece (the 1857 one, yes, I know that one quite well & for a long time I felt that it was really Lizzie’s work, not Gabriel’s — & perhaps it was, at least in part –certainly looks to me like hers), and I had no idea that it (this 1862 watercolor)was created just before Lizzie’s fatal OD.